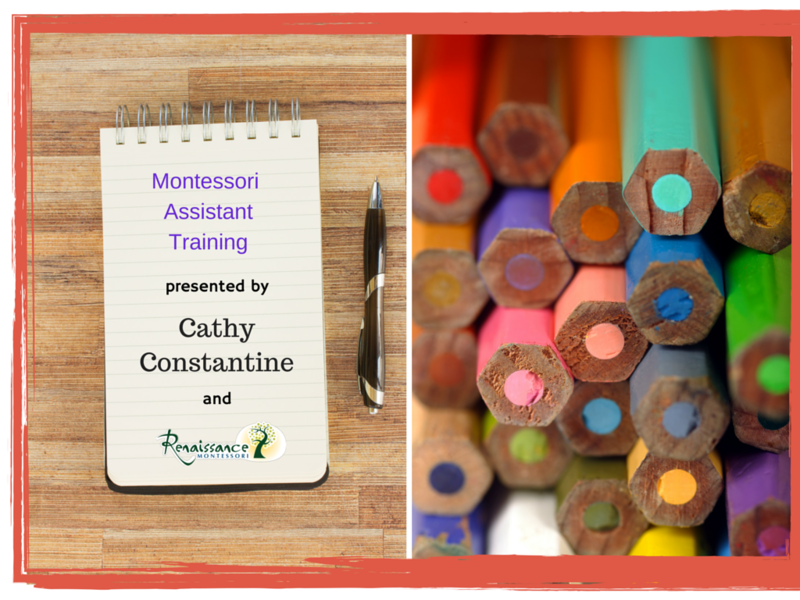 Cathy Constantine will offer the Primary Assistant Overview Training at Renaissance Montessori in August. This course is open to teacher assistants from any school. Monday, August 3 through Friday, August 7. Each day will begin promptly at 9:00 am with a short discussion pertaining to development, theory and philosophy, followed by a period of presentations and, if needed, practice with the materials. Students will be responsible for creating the Practical Life area of the classroom. Each student will be given plenty of time to create, problem solve and develop a sequence of materials that are enticing and beautiful. 25 attendance hours of continuing education, approved and recognized by DHHS. 3) The cost of this program is $300.00, and limited to 25 students. Please mail checks, made payable to Cathy Constantine and postmarked by June 15, to 7032 Shady Glen Lane, Wake Forest, NC 27587. Reservations will be on a first come, first served basis, and is limited to the first 25 registered students. Registration closes June 15, 2015. Please wear comfortable clothing, bring your own snacks/lunch and drinks and lawn chair. Students will will have a 45-minute lunch break each day. Cathy Constantine has been in the Montessori field for over thirty years. She began teaching in a primary classroom in 1987 and continued to grow professionally throughout the course of her career. Cathy loves children and truly believes in the Montessori philosophy. Cathy graduated from Lesley University with a Major in Human Development and a Minor in Early Intervention. She obtained her 3-6 Montessori credential in 1987 from Northeast Montessori Institute and her 6-12 credential from Seacoast Center of Education in 2006. Cathy has taught children from ages 3-12 for many years in private schools and charter schools. She was the co-owner of Casa Dei Bambini, a small school which has grown to be a modified Montessori program for children with learning differences. She is also a teacher trainer for Seacoast Center for Education and teaches primary and elementary programs. Cathy is also Orton Gillingham trained. Cathy was born and raised in Southern New Hampshire. Having moved to North Carolina eight years ago, she is happy to be away from the cold weather. She and her husband now reside in Wake Forest. 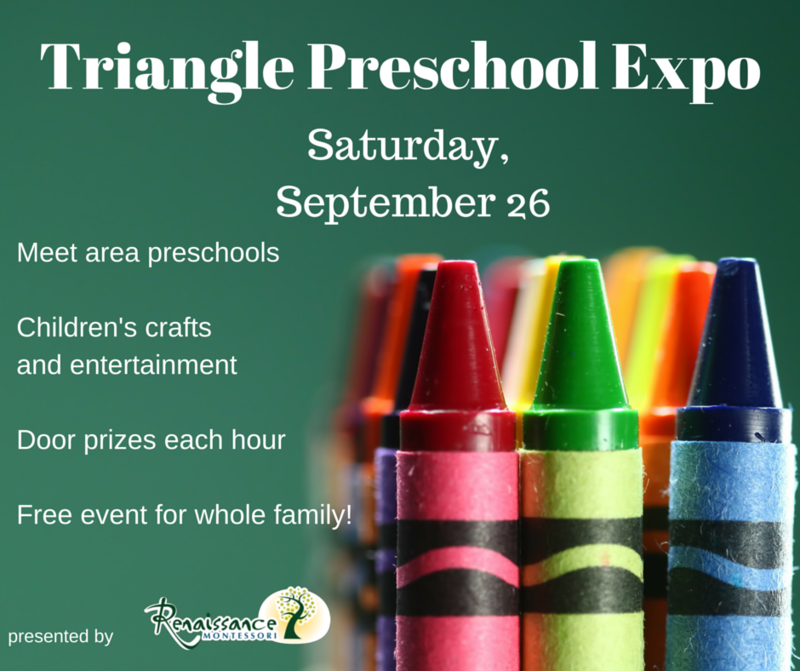 Parents, join us for an interactive, family-friendly event connecting area preschools and parent resources with families. Saturday, September 26 from 10 am to 3 pm. Free and open to the public. Door prizes and children’s activities each hour.